Reposted from gazettenet.com with permission Among the world’s great urban streetscapes, there are few rivals to Chicago’s Michigan Avenue where an escarpment of landmark buildings to the west faces a collage of parks and the fabulous Chicago Art Institute to the east, with Lake Michigan beyond. Dedicated in 1836 to remain “forever open, clear, and free,” Chicago’s downtown lakefront along Michigan Avenue is shared by two iconic parks — Grant Park and Millennium Park — that together bookend the past century and its social history. Grant Park is a sprawling exemplar of early 20th-century aesthetics and paternalism. 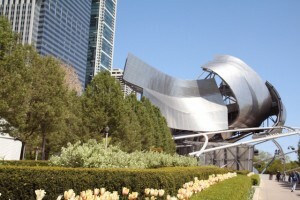 Millennium Park, which opened in 2004, is a compact $470 million gem of new-age park design — a signature legacy of Mayor Richard M. Daley, architect Frank Gehry and the park’s impresario, Edward Uhlir. Chicago's Millennium Park. Photo by Shelly S, used under Creative Commons licensing. One hot July afternoon, I strolled through both parks and — like the yellow taxi in Woody Allen’s “Midnight in Paris” — I warped across time and social change. Grant Park exudes an “old order” focus on how a park (or a city) looks, especially to persons with the right taste and pedigree. Millennium reflects a “new order” that is guided by how a park (or a city) feels to the general populace and serves their diverse needs. 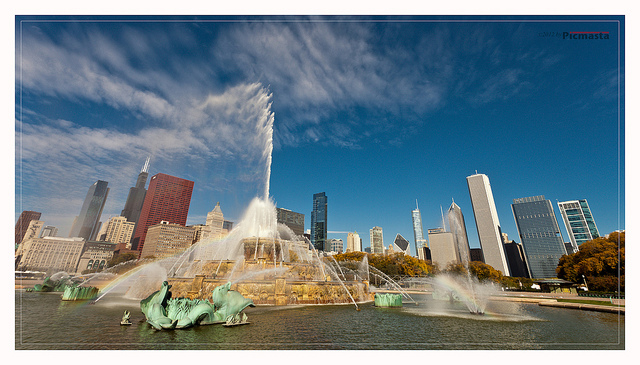 Reflecting the patrician formalism of the “city beautiful” movement that swept through America’s cities in the early 1900s, Grant Park is a mosaic of manicured lawns, hedges and gardens, divided by walks and roads and punctuated by statues, monuments and fountains. At its center is Buckingham Fountain, a huge confection of marble nymphs and bronze dolphins set in a reflecting pool, which has awed generations of visitors. Grant Park also provides athletic fields and hosts food and jazz festivals. Its free summer concerts are a beloved Chicago tradition. Buckingham Fountain in Grant Park, Chicago. Photo taken by picmasta, used under Creative Commons licensing. On my summer visit, however, Grant Park presented a less inviting face. The immaculate flower gardens and lawns were still there but were cordoned off by dense hedges and barriers. Buckingham Fountain was fenced and posted against wading — not exactly “open, clear, and free.” Few people were around. I bought a cold drink and looked for a shady place to sit, but all benches beneath trees had been removed leaving only those in the open sun. I located a break in a hedge and plunked down on a forbidden patch of shaded lawn. Moments later, a homeless man dragging a pink suitcase did the same. I asked him why there were no shaded benches. His response: to discourage people like him from using the park. I gave him some money and watched him trudge off with his suitcase. What a contrast awaited me a short walk up Michigan Avenue past the Art Institute. Millennium Park that afternoon was packed with people of every description strolling, sitting, wading, munching, clowning around the Cloud Gate mirrored sculpture (“The Bean”), or contemplating the ever-shifting faces on the digital towers of Crown Fountain — all on a 25-acre green roof above an underground parking garage and rail station! Read the full article. Rutherford H. Platt is Professor Emeritus of Geography at the University of Massachusetts Amherst and a Lifetime National Associate of The National Academies. His new book is Land Use and Society, Third Edition.